Through the use of artificial intelligence, Radbot monitors light and human activity by tracking how often householders use their rooms in order to establish their patterns of movement. By doing this, Radbot then understands when it needs to heat a radiator, ensuring the room is ready and warm for householders. Not only that, but it is also highly intuitive. If a person uses a room outside of their usual routine, Radbot will understand that it needs to heat the radiator there and then. For extra speed, there is also a boost button that gives householders an extra 30 minutes of heating. Radbot is now on sale through the EDF Energy website, and direct at the Radbot store, retailing at around £64.99 each or with a 25% discount for four, at around £195. *Based on four to five devices being installed in a home with an average £1,200 dual-fuel annual heating bill. If you have existing thermostats on your radiator (the hand-controlled dial with which you can set the temperature) then you simply unscrew them and replace it with the new product. This new device takes minutes to install and needs no tools or special skills, in most households. Just put in batteries, install by hand and set the heating level. The device comes ready-to-go with two x AA batteries which should be replaced around every two years. After installation, the device starts to monitor your heating needs and manage your radiator, looking to save you as much money as possible. This is a next generation smart radiator valve. It uses artificial intelligence to monitor your usage of the room in which it is installed. When you are not using a room Radbot allows it to cool a little (typically by up to 3°C during the day so it won’t get freezing cold) and starts to heat the room in time for it to be warm for when you return. The device is very secure. It is independent; it doesn’t need Wi-Fi or 4G and does not have a camera. The data it collects is continually over-written. This means the data cannot alone be attributed, effectively, to an individual or family. 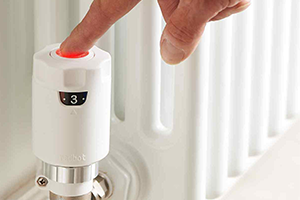 Radbot is designed to be applied to ‘wet’ radiator systems which are prevalent in the UK and northern European countries. It is mainly of benefit to countries that see defined seasonal ‘winter’ periods where heating systems are on for sustained periods. The intelligent software which is at the core of the design has applicability to other similar heating and cooling systems, this is a likely development path for further evolution of a product range.